The foil is a descendant of the light court sword formerly used by nobility to train for duels. It has a flexible, rectangular blade approximately 35 inches in length and weighing less than one pound. Points are scored with the tip of the blade and must land on valid target: torso from shoulders to groin in the front and to the waist in the back. The arms, neck, head and legs are considered off-target – hits to this non-valid target temporarily halts the fencing action, but does not result any points being awarded. This concept of on-target and off-target evolved from the theory of 18th-century fencing masters, who instructed their pupils to only attack the vital areas of the body – i.e. the torso. Of course, the head is also a vital area of the body, but attacks to face were considered unsporting and therefore discouraged. 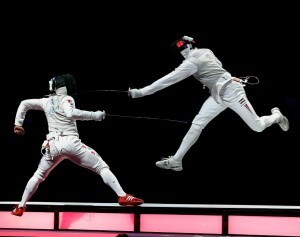 Although top foil fencers still employ classical technique of parries and thrusts, the flexible nature of the foil blade permits the modern elite foil fencer to attack an opponent from seemingly impossible angles.